Toyark's MOTUCG fall 2018 update galleries! Time for some catch up! 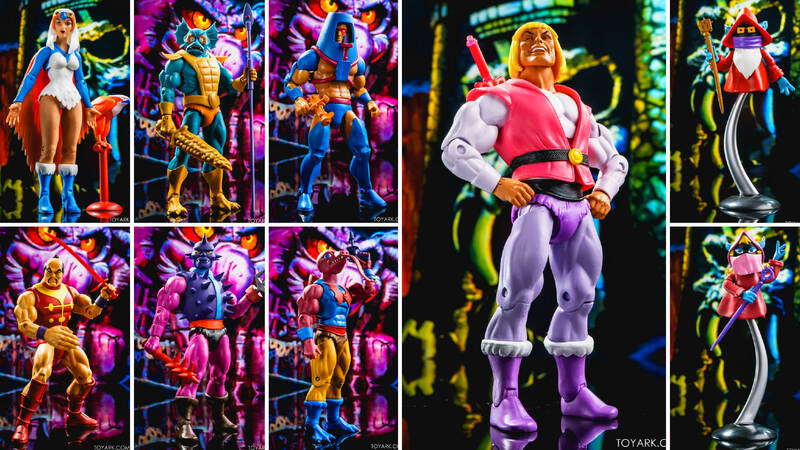 Mer man, man e faces and Prince Adam are tops for me. I appreciate the deep roster stuff but personally just want the core guys. Tony, I love this photo set. Great composition and the colors are so vibrant! great job as always. My lord,I wish my pics came out a fraction as well as yours do. I own all of these except for laughing Adam....on order at BBTS. They really are beautiful. I prefer classics but the filmation is growing on me. Your pics certainly help that along. Yeah- those pics are fantastic! but it really reminds me of how much I hated the Filmatiom toon as a kid. I picked up laughing Adam for the pic possibilities, but the rest of these are easy passes. Boy, there are some weiiiird faces in this. Spikor especially. And old Orko has glassed glued to his blank black orb of a head? Yeah, especially compared to the awesome designs of the 2002 show, these just look really silly and not very detailed.